Do you have a problem ranging the flagstick while golfing? Are you having problems isolating your target from other obstructions while hunting? You are not alone. Thankfully, the best Nikon rangefinders can help set things right. Nikon, like other renowned rangefinder brands, makes some of the best ranging devices some of us have never seen before. That means your shots will be more accurate. You’ll be able to calculate elevation compensation, horizontal and vertical distances and have steady and clear images of mobile targets as well. Seems perfect, right? This article will take you through a few things you must know before buying not only a Nikon finder but those of other brands as well. We have also reviewed 7 Nikon rangefinders that we believe you may be interested in. Let’s jump in by taking a look at the comparison table of the products reviewed below. 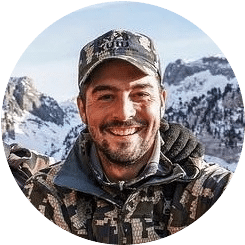 Judging the distance to your targets when birding, golfing, hunting or surveying is one of the most difficult, yet essential tasks while in the field. Knowing how far you need to shoot is a critical aspect of ensuring you don’t wound a deer or hit a miss while golfing. 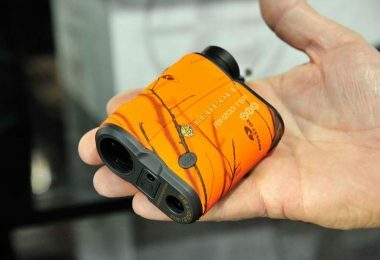 To refine your ranging abilities, you might need to work with some of the best laser rangefinders. Size matters a lot when buying a rangefinder. As a hunter, you already have a bag-load of other important accessories to make your work easier in the field. When you add a heavy finder to the list, the problem becomes even more important. However, some of the devices that are a little bit bulkier sometimes tend to come with many cool features. So, know when you need to compromise on the size. Otherwise, compact and lightweight rangefinders should always be prioritized. Do you shoot from a forest with thick grass and shrubs? Is the terrain full of slopes and bumpy zones or is it a flat land? If the area is flat and there are no barriers, then you don’t need to spend money on finders with angle compensation and other distance corrective features. There is also the issue of light. You’ll note that a couple of finders reviewed in this guide don’t do well in poorly lit areas. This means you’ll need a flashlight to view the readings. Most mid to high-end rangefinders come equipped with a bright light to ensure effortless reading on the screen. This is the most important aspect to check in any rangefinder. A finder with all the bells and whistles will serve nothing if it can’t accurately pinpoint the distance of an object. High-end rangefinders can range from a minimum of 5 yards and stretch all the way to 1600 yards with an accuracy level of +/-1. Most mid to lower end models can range objects up to about 800 yards. If you are a bow hunter, settle for a short to mid- rangefinder. However, rifle hunters need units that can go all the way to 1600 or more yards. Magnification also counts a lot when dealing with rangefinders. The more powerful the magnification, the bigger and clear the image will be. Remember though that the higher the magnification, the lower the field of view obtained. Hunters need a magnification level of 5x or more to get bigger images while golfers may need 6x or more. Bow hunters, on the other hand, can do fine with 4x magnification. Whether you are a newbie or a seasoned outdoor person, having an easy-to-use rangefinder is very important. Most of the units reviewed in this article are single button operated where one button controls most of the functions of the finder. Some finders come with two buttons. One to power it on and the other to adjust it to any desired settings. The display should be simple to read even in the dark. Also, the eyepiece must be adjustable so you can customize it to your preferred options. This refers to the closeness to the true value. Basically, a good rangefinder should measure distances with a deviation of +/-0.5. The worst accuracy level you should tolerate for target shooting is +/-1. Anything above the listed accuracies will result in inefficiencies. That said, you might want to settle for a +/- 2 yards accuracy if you’re interested in an estimate rather than a very precise distance. That can happen for the long-range shooting of bigger game. Rangefinders come with different types of lenses. Each lens is configured to work differently in a certain environment. To amplify light transmission, most of them sport some coatings on their surface. For simple coating, at least one of the lens surface sports a single layer of chemical coating, while fully-coated items have every lens surface with a single layer of chemical coating. Multi-coated devices have at least one lens surface with multiple coating, and fully multi-coated rangefinders sport multiple coats for all their lenses. Obviously, a rangefinder with any of the last two coatings will perform well even in dark areas. 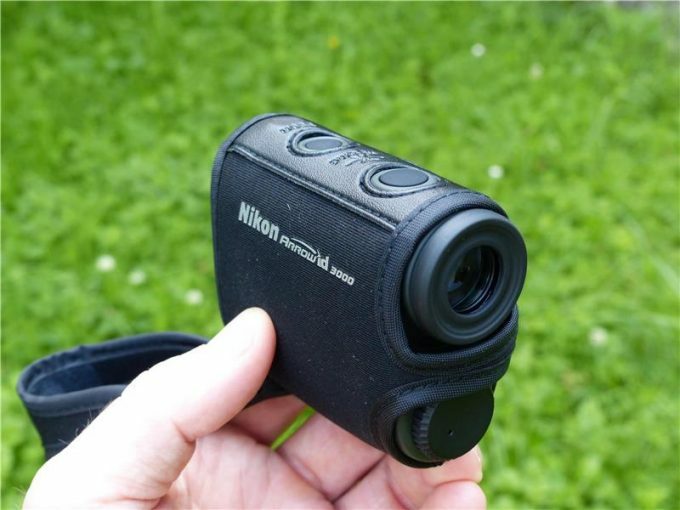 Description: If you are a newbie in need of a simple rangefinder without too many complexities, then the Nikon 8397 ACULON AL11 Laser Rangefinder might suit you. So, what makes it a dependable shooting partner? Starting with optics, Nikon 8397 ACULON is loaded with high-quality lenses that are heavily multi-coated to amplify light transmission. When coupled with its 6x magnification, the images obtained are ultra-clear up to 550 yards. The only shortcoming is that clear views cannot be obtained in darker areas. Nikon 8397 ACULON utilizes a high eye-point design that is comfortable enough even for glass wearers. Despite having a higher magnification power, the finder still manages to provide a wider field of views than its competitors. Its display is a bit minimalistic in that only 1 meter/yard interval is displayed. The battery life is also shown so you can know when to insert a new pair. This finder takes a compact design with two buttons, each on the other side to avoid confusion. The buttons are big enough so you can spend a little time tracing them. The small size means the rangefinder can comfortably fit in your hands or hang over your chest without you feeling weighed down. The battery compartment is easy to access and doesn’t need any special tools to open it. One of the best features Nikon 8397 ACULON comes with is the target priority mode. This is something even high-end devices tend to lack. Here is how target priority mode works; let’s say you spot a rabbit at 225 yards away but there is a branch 15 yards within the sight, the finder will ignore the branch and give you an accurate reading of 225 yards away. With this rangefinder, your priorities will always be dealt with first. Related: When using Nikon 8397 ACULON to hunt, get yourself Primos Deer Call Can and you won’t have to wait or search for bucks. The can produces the perfect doe breeding bleat that lures in their male counterparts. Description: If your mission is to have the easiest time in the field, then perhaps you need not to think twice about buying Nikon 16224 Arrow ID 3000 Rangefinder. This finder, unlike the one above, is packed with convenient features that aim at making your work simpler. For instance, when ranging a target, this finder provides both horizontal and straight distances-no matter the incline or decline angle. The Tru-Target Technology is one of the best accuracy-enhancing features this finder is endowed with. The technology operates via two modes: first target mode where your target is brought up-close and distant target mode where the field of view captures other objects in the surrounding. Tru-target is meant to be used in places with a lot of bush or tall grass. When it comes to image focus, this rangefinder performs very well with its magnification power of 4x. Isn’t 4x lower? No, it’s not-especially for an equipment designed primarily for bow hunting. The lower the magnification, the wider the field of view. A lower power is also good for ranging mobile targets. Design wise, Nikon 16224 Arrow ID 3000 resembles Nikon 8397 ACULON above with two buttons at its top. The power button is placed near the 18 mm adjustable eyepiece while the mode button, which changes the settings lies at the front, near the objective lens. While most pictures showcase this unit as black, it’s actually dark-green. 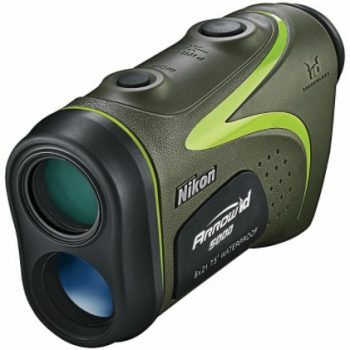 Related: Nikon 16224 Arrow ID 3000 qualifies as one of the best crossbow hunting rangefinders. However, the best results can be obtained when you have Excalibur Boltcutter 3-Blade Broadhead for speedy shots and Energizer CR2 3-Volt Photo Battery as power backup solution. 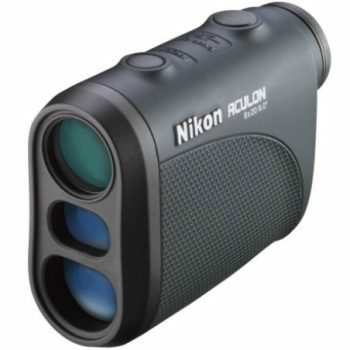 Description: Nikon 16229 Prostaff 3I Rifle Range Finder is a capable finder that is compact, lightweight and equipped with 6x magnification power. It’s designed to range reflective objects that are up to 650 yards away. The image is displayed on its black LCD screen which also displays the mode in use, angle compensated and battery life. Like most rangefinders, this one too runs on a single CR2 battery. Nikon is fast, effective and consistent. It’s a sophisticated tool with all the exemplary features seasoned shooters deem valuable. For instance, the “first” and “distant” target modes make it easier to range any target between 8 to 650 yards. The ID technology enables it to calculate and display angle compensated readings. The scan mode on this finder makes it possible to move from one target to the next easily as it updates the readings-a process that takes 8 seconds. This finder is an all-around tool that can be used for hunting, shooting, targeting and surveying. Thus, it features not only a powerful magnification but a wider objective lens, larger ocular and Nikon’s legendary multi-coated optics to ensure only outstanding views are obtained. 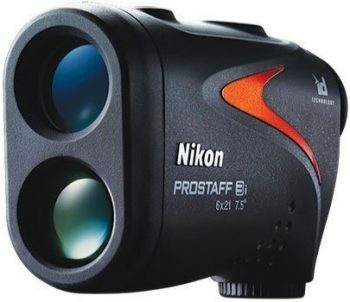 Nikon 16229 Prostaff’s outer casing is rugged, waterproof and fogproof to ensure longevity. However, it’s a bad idea to expose it to too much moisture. Related: Nikon 16229 Prostaff is usually bought together with NAP Bow Stabilizer and Wildlife Research Center Body Wash Scent Killer. The former stabilizes the bow to minimize vibration and noise while the latter kills any scent ensuring that animals don’t sniff your presence. 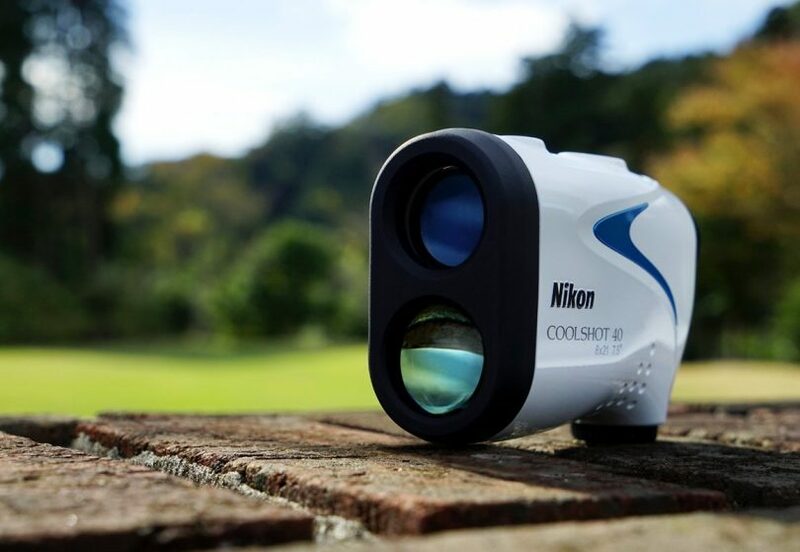 Description: The laser technology embedded in Nikon COOLSHOT 20 Rangefinder makes this device extremely accurate at calculating distances. 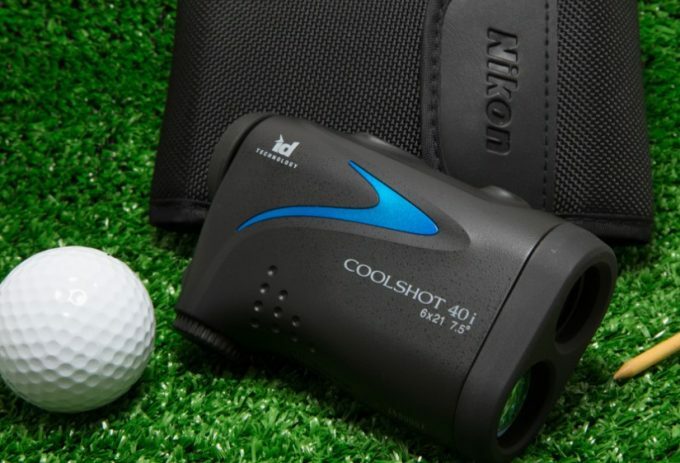 Coolshot is designed to assist a golfer view what lies ahead of the ball, behind it as well as the vastness of the flagstick area. With a single button and 8-second scanning mode, the finder will measure for you the distance of small or multiple objects enabling you to avoid trees, mounds or pins. When it comes to clarity, you can count on COOLSHOT 20 not to let you down. The ocular and objective lenses are pretty large to provide a large, unobstructed field of view. Thanks to Nikon’s legendary multi-coated optics, adequate light passes through the unit to display the target clearly. Nikon boldly refers to COOLSHOT 20 as a tiny gadget that packs a hefty punch and judging by its weight and number of features, their sentiments are very true. 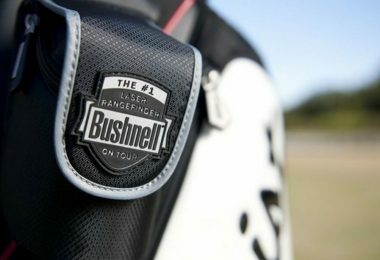 The finder measures 3.6 x 1.5 x 2.9 inches and weighs 4.4 ounces making it one of the lightest golfing tools out there. The ability to fit into an ordinary pocket makes it a less inconvenient item to carry around. The material makeup in COOLSHOT 20 allows you to keep using it even in bad weather. The outer casing is rainproof and can tolerate extreme temperatures thus no need to tuck it away on a hot or cold day. After 8 seconds of idling, the device will shut down to conserve power. 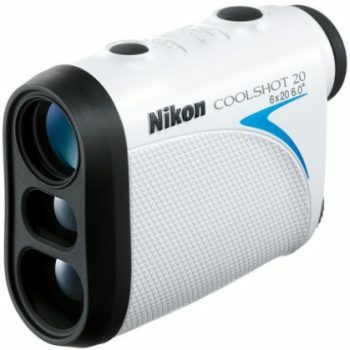 Related: Nikon COOLSHOT 20 is made primarily for golfers and hence imperative for one to own Callaway Chrome Soft Golf Balls to play or practice with. Stick It Magnetic Strap does also come in handy for securing your finder on the cart, so you don’t lose it. The strap has a tapering end to avoid covering the operating button. Description: The vibration reduction technology puts Nikon Monarch 7I Rangefinder far ahead of the game compared to its competitors. This technology absorbs handshakes and any other vibrations to ensure you obtain a less blurred image. The VR technology also aligns the target with the laser beam thus increasing precision. 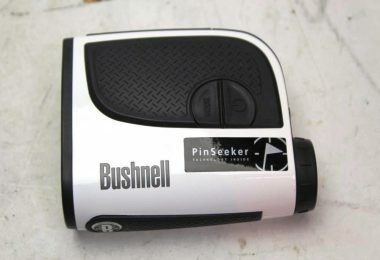 This rangefinder has a far-reaching yardage and thus good for long-range hunting and shooting. 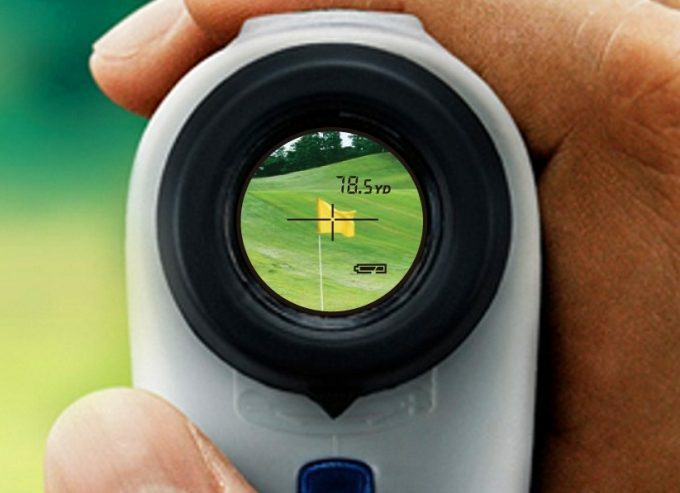 Nikon’s HYPER READ technology makes it very easy and fast to measure distance no matter how far the target is. Nikon Monarch 7I works in increments of 1-yards and an accuracy level of +/-0.5 yards up to 700 yards. Beyond 700 yards, the accuracy stretches a bit to +/-1 yards. Monarch 7I’s Tru-target Technology allows you to work with two interchangeable ranging modes depending on the hunting circumstances. The “first” target mode is excellent for ranging smaller objects the size of a fence post or golf stick flag. The distant mode conveniently isolates your target from a group of objects far away and precisely records its range. When ranging objects at various angles, this finder jumps in to record vertical and horizontal displacement in accordance with the angle used. All the images obtained are ultra-clear thanks to its impressive multi-coated optics and a powerful 6x magnification. The finder is compact, lightweight and sports a tough casing to protect it from water and other harsh weather elements. Related: Like most finders, Nikon Monarch 7I rangefinder too uses CR 2 batteries. Therefore, you need 10 pcs Tenergy Propel CR2 Battery as your power backup solution. Since this unit is a bit heavy to suspend on the neck for long, you may hang it (and other accessories) on T-REIGN Large Retractable Gear. 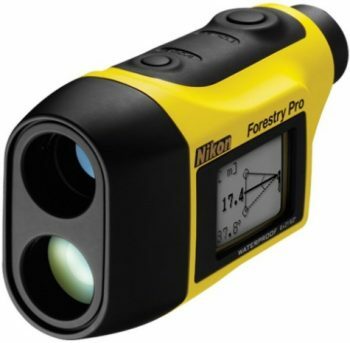 Description: Nikon Forestry Pro Laser Rangefinder ensures fast and accurate measurements when determining the angle, relative height, and the distance between any two points on a surface. This compact, lightweight, and waterproof finder was designed primarily for forestry needs, but it can extend its functionalities into golfing, hunting or surveying. Straight to the juicy stuff, Forestry Pro features the best quality optics that are multicolored to drum up for more light transmission. The monocular eyepiece features a lens that magnifies up to 6x, which is good enough for long-range observation. All the results are displayed on an external display with an extra option for internal display of only a few selected items. The minimum ranging for this device is 11 yards, with a maximum of 550 yards. The single button it’s operated with can be toggled to provide readings in meters as well. While viewing your target, you can make use of the Tru-Target Technology to view objects in either first or distant mode. Like most rangefinders, Nikon Forestry Pro is powered by a single CR2 battery. Considering the premium optic features it bears, you need to carry along a few extra batteries to avoid being caught unaware. To help keep power usage on a minimum level, the finder auto shuts after 30 seconds of idling. Related: With two display modes and multi-colored optics, Nikon Forestry Pro offers impressive optics but at the expense of the battery life. Therefore you need Duracell CR2 Photo Battery 3V 6 Pack to keep the fun going on. This product, along with its other smaller accessories are normally stored in TOUGH Laser Rangefinder Case. 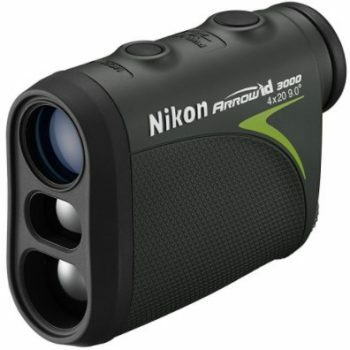 Description: Nikon Arrow ID 5000 Bowhunting Laser Rangefinder is in many ways similar to Nikon 16224 Arrow ID 3000. They both feature Nikon’s ID Technology, Target Priority mode, multilayer coating and come almost at the same price level. However, judging by Nikon Arrow’s version “5000,” this one could be slightly advanced than its cousin. Where does it beat Nikon Arrow ID 3000? It comes with a powerful 6x magnification power, a large ocular lens and a long range of up to 600 yards. Its image display is a bit far better in clarity thanks to Nikon’s legendary multi-coated optics. Nikon Arrow ID 5000 is entirely user-friendly. It comes with two buttons; one for powering it on and the other to adjust it to various desired settings. Even with batteries included, this unit feels less of a burden and doesn’t get in your way of shooting. It tags along with one CR2 battery, a neoprene case, and straps to suspend it on your neck. Related: Nikon Arrow ID 5000 is frequently bought together with Viridian CR2 3v Battery (three of them) because it tends to use a lot of power courtesy of the power-hungry features it has. You may also want to buy the T-REIGN Retractable Gear to attach other items you may have carried along. If you run back to the top of this review and check the comparison table for the second time, you’ll note that most of the Nikon rangefinders reviewed in this article have a lot in common. For instance, most of them have 6x magnification, except Nikon 16224 Arrow ID 3000, around 21 mm objective lens, coated optics and a few advanced features. 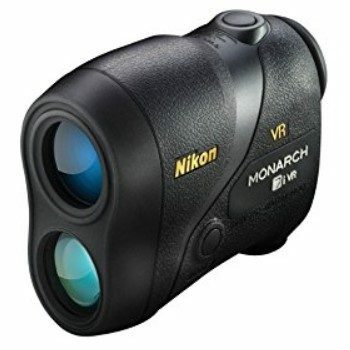 However, the finest of them all could be Nikon Monarch 7I VR Range Finder due to its coveted ability to absorb vibrations thus providing steady images. Nevertheless, always buy a finder according to your needs and financial muscle. Have you ever used any of the products reviewed in this article before? Do you have anything to add? Feel free to share your comments with our readers.